Lazesoft Windows Key Finder is a dead simple key finder program. It's completely portable, uses just over 1 MB of space, and is really easy to read and use. Almost all versions of Windows and Microsoft Office product keys can be found and saved with Lazesoft Windows Key Finder. 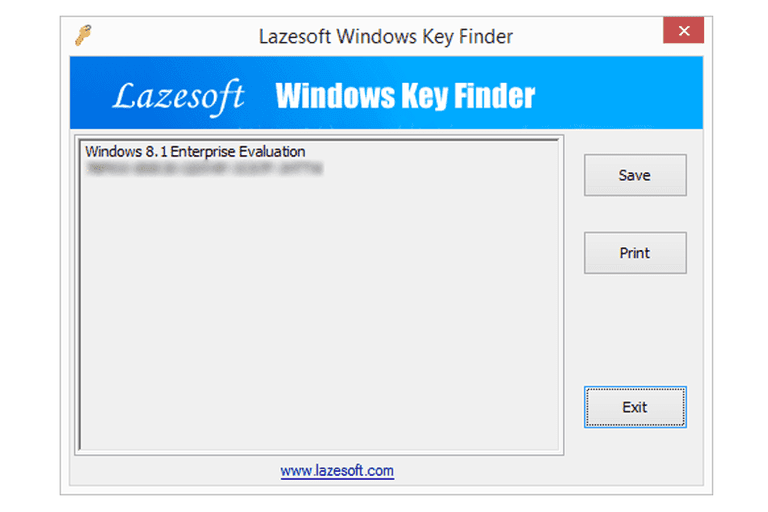 This review is of Lazesoft Windows Key Finder v1.7. Please let me know if there's a newer version I need to review. If you're looking for a key finder program that's easy to use and free from clutter and tons of extra features, Lazesoft Windows Key Finder is definitely a good choice. Just three buttons are present — Save, Print, and Exit — which renders Lazesoft Windows Key Finder extremely easy to understand and use. The only other option is to copy specific product keys from the program window via the right-click context menu, and since the keys are listed in text form, it's really easy to do so. It's too bad that Microsoft Office is the only other program supported apart from the Windows OS, but it's great if you need to find product keys for some of the newer Windows operating systems. If you didn't find what you were looking for with this key finder tool, feel free to try a different free key finder or maybe even a premium key finder tool.